Anecdotal and published evidence about newborn screening programs show that many parents are not aware that babies are offered a screening test. This issue has sparked controversy and debate about the issue of obtaining consent. 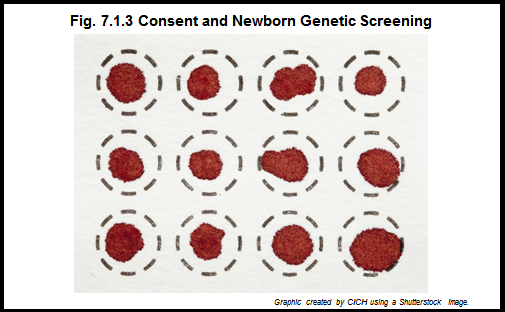 Most newborn screening programs do not require explicit consent from parents. Newborn screening is considered part of routine healthcare for children. Newborn screening for treatable and preventable conditions is considered to be in the best interests of the child. In Canada, we have what is called “implied consent,” which means parents are not necessarily asked. Doctors assume the parents want screening unless they say otherwise. As a result, although parents are provided with newborn screening pamphlets and the right to decline testing, they may not be aware that newborn screening has been carried out and for which diseases. Newborn screening raises a number of legal and ethical issues. Parents may have limited knowledge of the programs and, for this reason, the informed consent process provides an opportunity to educate them on the specifics of the screening procedures. Requiring explicit consent, however, requires additional resources for program implementation. Nevertheless, the timing for giving this information is important.